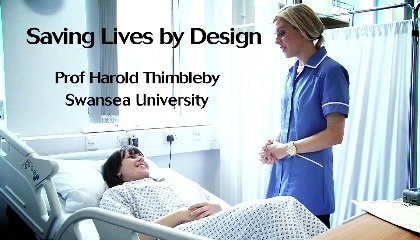 A short film clip about medical device design, about the problems and opportunities to improve design. There’s a whole programme here to be made on the issues! As mentioned in the film clip, in any given year more people die in hospitals from medical errors than die from car accidents, breast cancer, or AIDS — three causes that receive far more public attention? It’s design problems that need fixing, and fixing design would reduce all the effort currently put into workarounds and training, so it would have many benefit. For more background, please see the The Clinical Human Factors Group and the classic report To Err Is Human: Building a Safer Health System by the US Institute of Medicine. For more details about me and my work, please see www.harold.thimbleby.net and www.chi-med.ac.uk, or email comments, thoughts or suggestions to me at harold@thimbleby.net please!